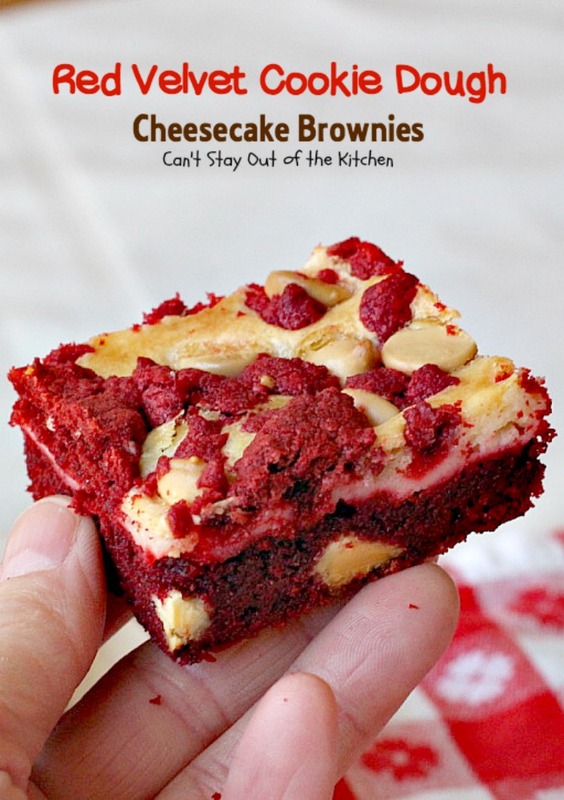 Red Velvet Cookie Dough Cheesecake Brownies are to die for! 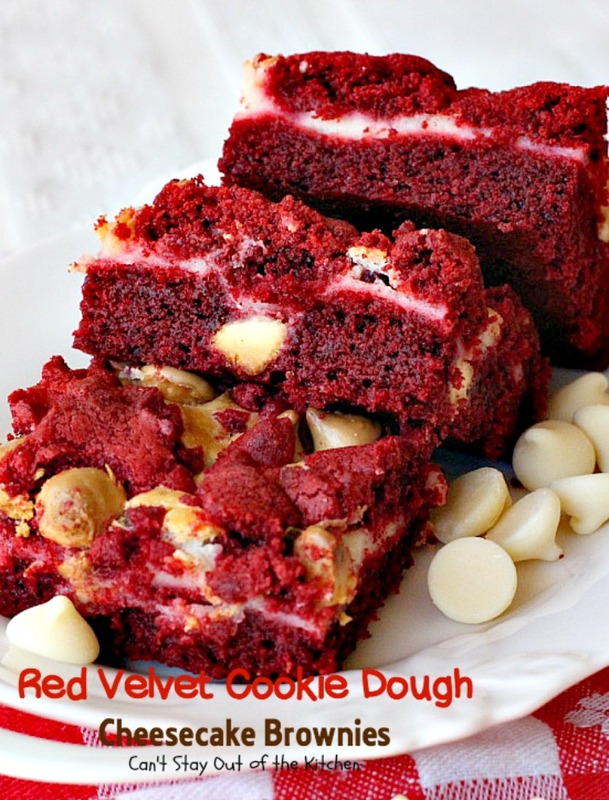 Here’s one more red velvet recipe before Valentine’s Day! 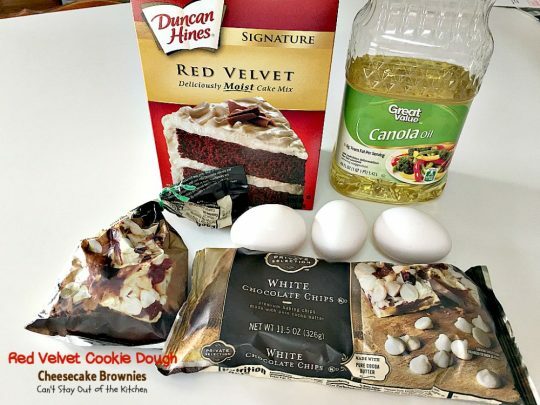 These decadent brownies are incredibly easy since they use boxed Duncan Hines Red Velvet cake mixes. There’s a delicious cheesecake filling in the middle and the red velvet topping is topped with more chocolaty flavor with the addition of lots of white chocolate chips! These brownies rock! 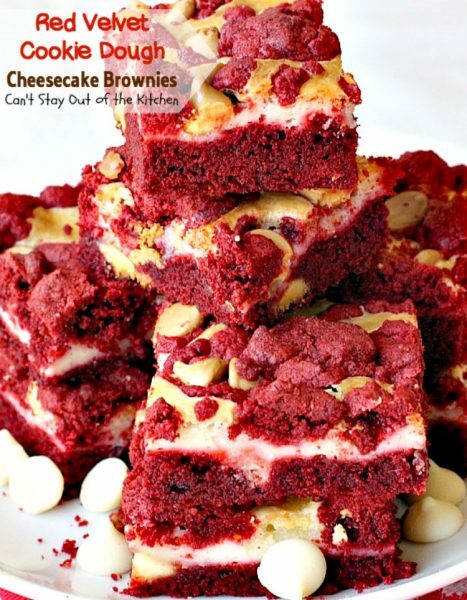 Red Velvet Cookie Dough Cheesecake Brownies are so delightful, so scrumptious, so sweet, so chocolaty delicious! These festive and beautiful brownies are an elegant dessert for holiday baking, Valentine’s Day, or special occasions like anniversaries, birthdays, bridal and baby showers, or on those days when you just want comfort food. The rich cheesecake filling is thick and sweet, and the white chocolate chips add additional punch to this great recipe. If you choose, you can swap out the white chocolate chips for semi-sweet chocolate chips or red M&M’s (which I used the first time I made this recipe). The idea for this recipe comes from my favorite recipe exchange person, Mimi Pownall. Her Chocolate Chip Cookie Dough Cheesecake Bars are fantastic. I have used that recipe with all kinds of assorted cookie doughs and combinations of chips. No matter the combination, each time the recipe comes out melt-in-your-mouth good. If you’re looking for a thrilling Valentine’s dessert that’s super easy to make because you start with boxed cake mix, yet has all the taste of a “from scratch” dessert then look no farther. 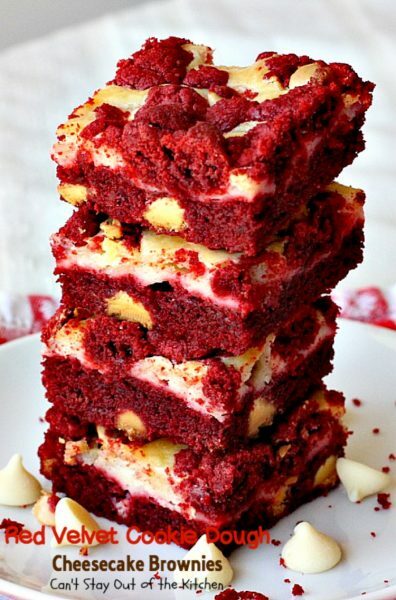 These super-duper Red Velvet Cookie Dough Cheesecake Brownies will get Valentine’s day off to a great start! Consider giving these amazing goodies a try. Your family will be so pleased that you did! When I initially posted this recipe in February 2013, I was still using an iPhone for a camera so my pictures weren’t particularly clear. As a result, I’ve been remaking all my first year blog recipes where I used the iPhone. I remade this recipe (February 2016) for my husband to take as gifts to friends. I retook the pictures and these turned out a little bit better. Red Velvet Cookie Dough Cheesecake Brownies are as mouthwatering as you could possibly want. Make them yourself and you’ll see! 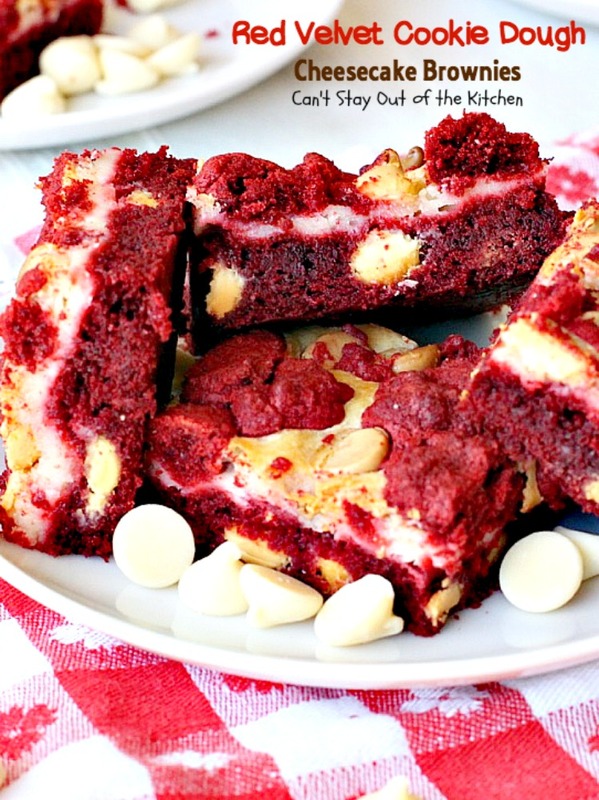 Red Velvet Cookie Dough Cheesecake Brownies have a marvelous taste. The cheesecake layer is thick and yummy. The white chocolate chips make this brownie doubly delicious. 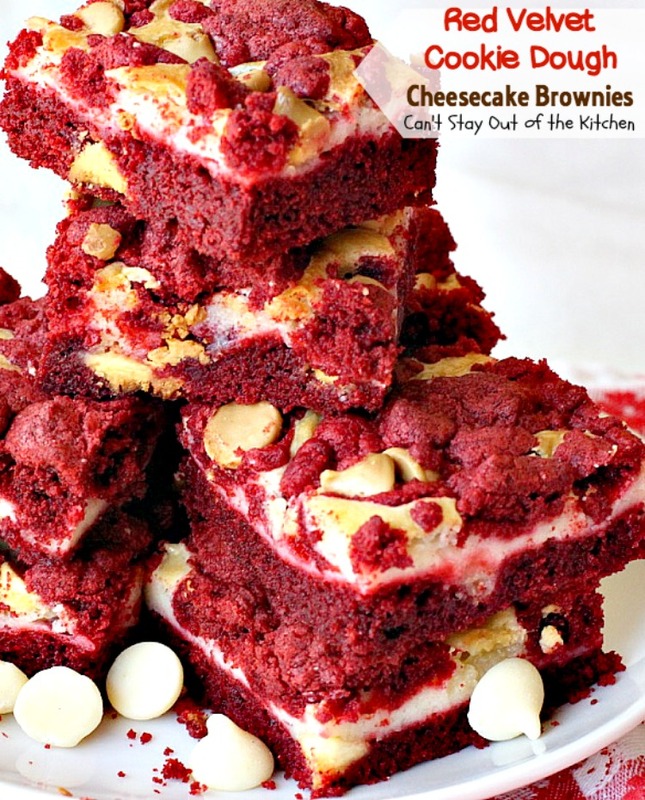 Red Velvet Cookie Dough Cheesecake Brownies are heavenly. These amazing brownies are a great treat for your spouse on Valentine’s Day or other holidays. I used these ingredients for the cookie dough layer. 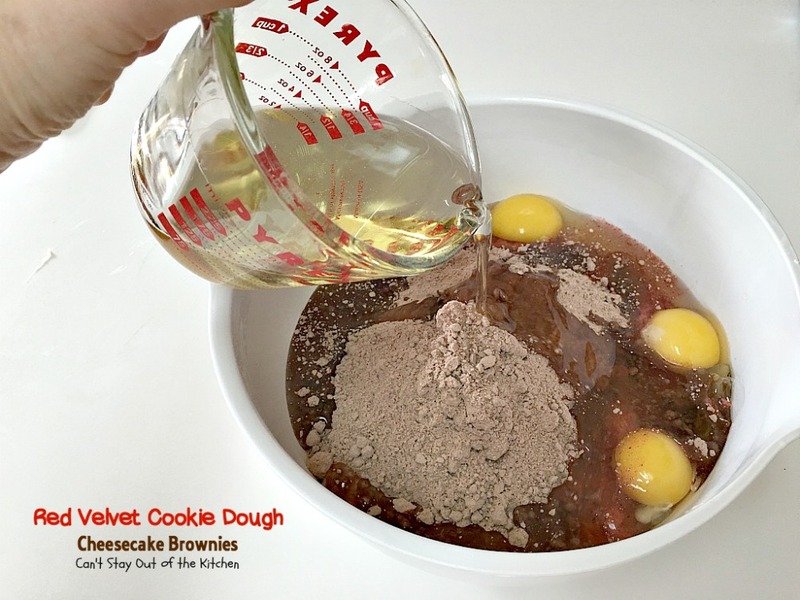 Place red velvet cake mixes, eggs and oil in a mixing bowl. Spray an 11″x17″ jelly-roll pan with cooking spray. Spread half to two-thirds of the cookie dough into pan. In separate bowl prepare cream cheese filling. Soften cream cheese. Add eggs, vanilla and sugar. Mix cream cheese mixture with an electric mixer until no lumps remain. Spread cream cheese filling over top of cookie dough crust. Crumble remaining Red Velvet cookie dough over top of cream cheese layer. Add white chocolate chips over top of the cookie dough topping. Cool completely. Cut into bars. 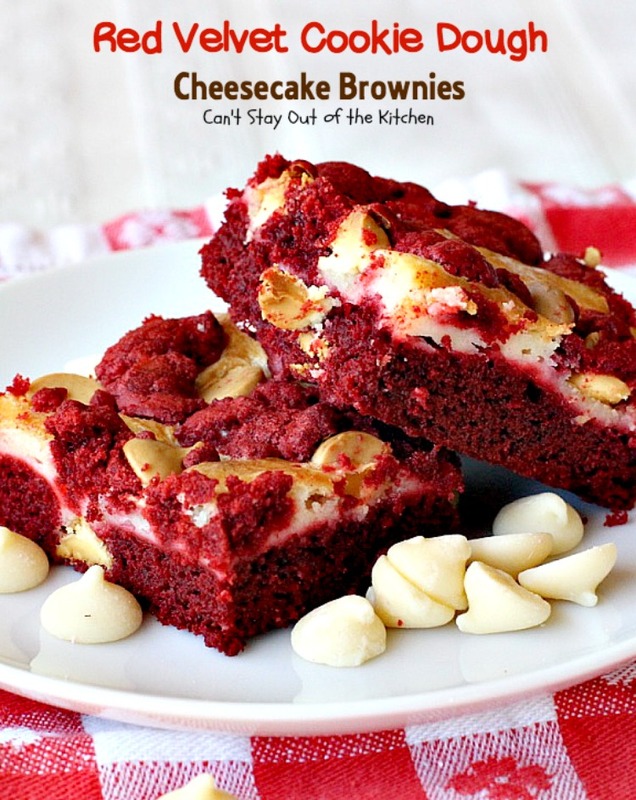 Each Red Velvet Cookie Dough Cheesecake Brownie is mouthwatering. Red Velvet Cookie Dough Cheesecake Brownies are so eye-appealing! Are you ready to snag one of these delicious goodies? 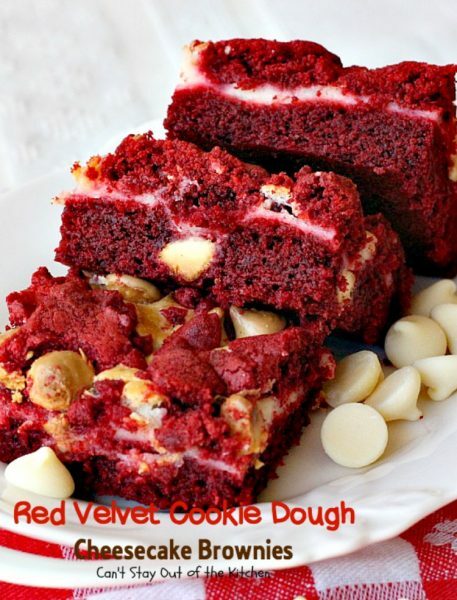 We love anything red velvet and believe you will too! Why not put these delectable bars on your holiday or regular baking list? 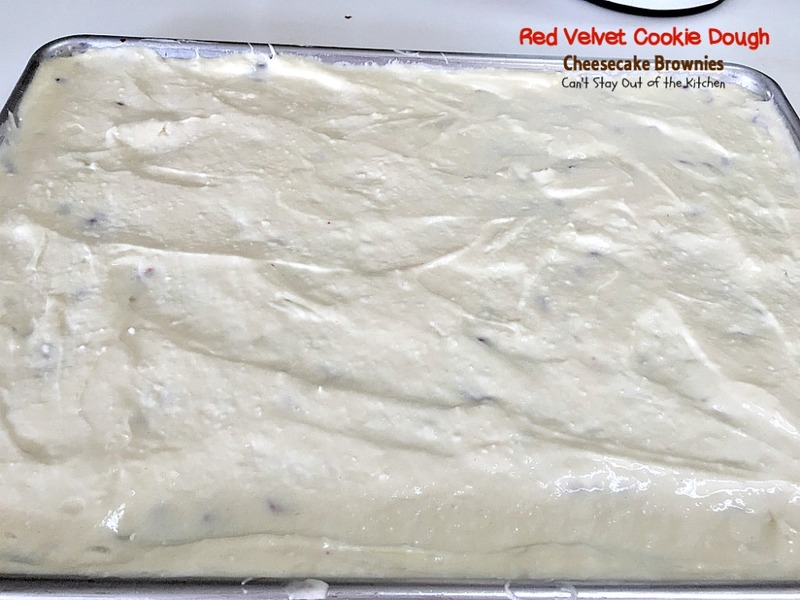 Red Velvet Cookie Dough Cheesecake Brownies are marvelous for parties, special occasions, or for a special treat for your spouse. These fabulous brownies practically melt in your mouth. They have a red velvet cake mix crust, then a cheesecake layer, a streusel red velvet topping and white chocolate chips on top. These lovely brownies are great for Valentine's Day, Christmas cookies or any time you want to enjoy a festive dessert! 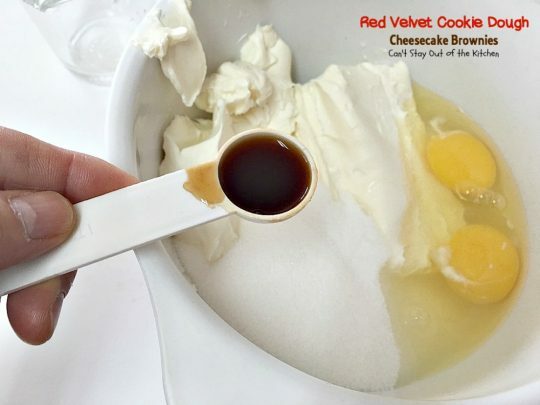 Stir cake mixes, eggs, and oil together with a wooden spoon until no lumps remain in the batter. 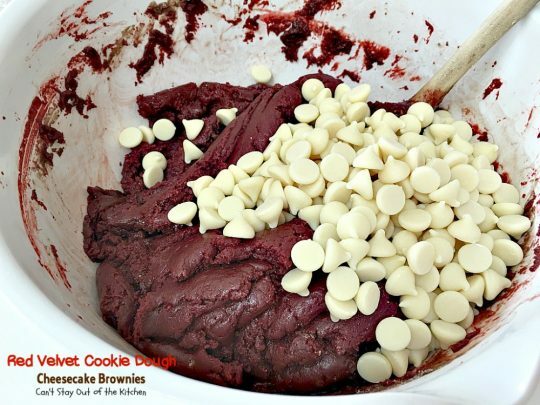 Add 1 ½ cups of white chocolate chips, semi-sweet chocolate chips or red M&M's. Press a thin layer of cookie dough about ½ to 2/3 of the mixture into a 11”x17” jelly roll pan that has been sprayed with cookie spray. Crumble remaining cookie dough over top of cream cheese layer. Sprinkle remaining half cup of white chocolate chips, semi-sweet chocolate chips or M&M's over top. Bake at 350° about 35-40 minutes or until toothpick inserted in center comes out clean. 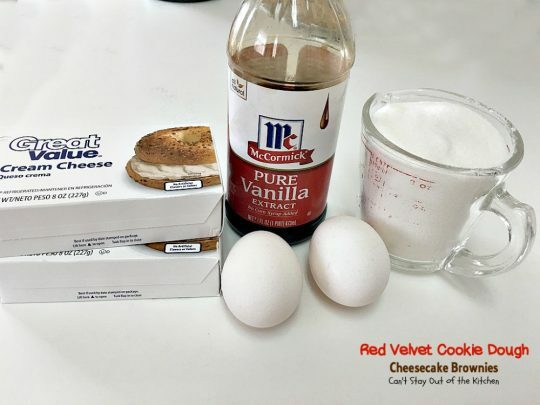 Mix ingredients with an electric mixer. Spread over top of crust layer. NOTE: I've always made the cookie dough part with a full cup of oil, however, one individual thought this was too oily. 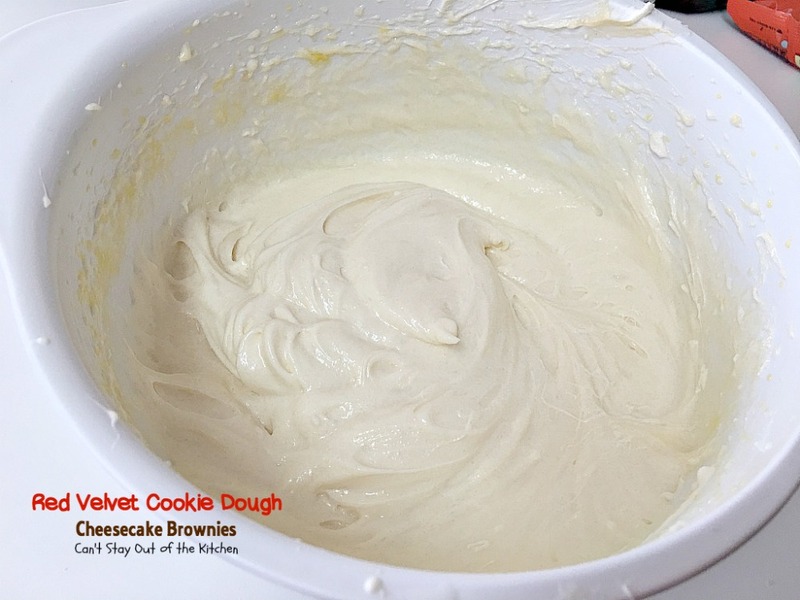 You can decrease the oil to 1/2 cup and substitute 1/2 cup water for the remaining part of the cookie dough. NOTE: This recipe calls for two full boxes of Red Velvet Cake Mix--not one. These fabulous brownies practically melt in your mouth. 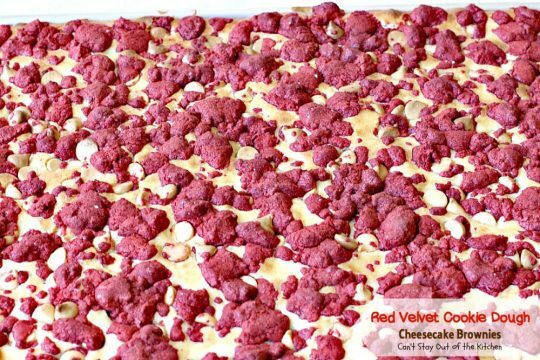 They have a red velvet cake mix crust, then a cheesecake layer, a streusel red velvet topping and white chocolate chips on top. 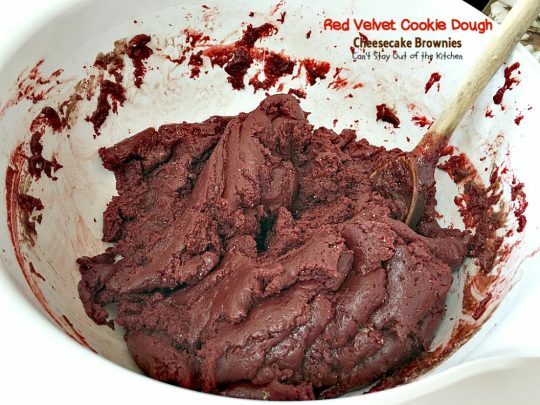 These lovely brownies are great for Valentine’s Day, Christmas cookies or any time you want to enjoy a festive dessert! 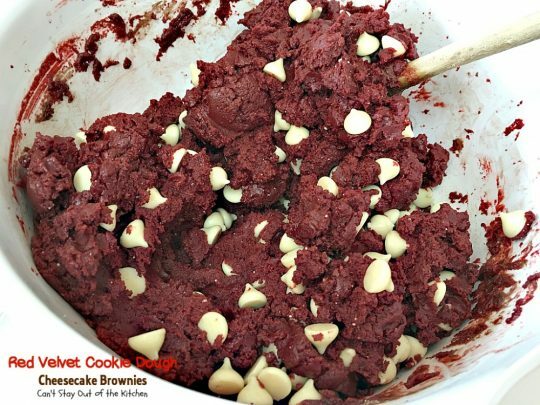 Add 1 ½ cups of white chocolate chips, semi-sweet chocolate chips or red M&M’s. Sprinkle remaining half cup of white chocolate chips, semi-sweet chocolate chips or M&M’s over top. You can see the thick, dense texture of these brownies. 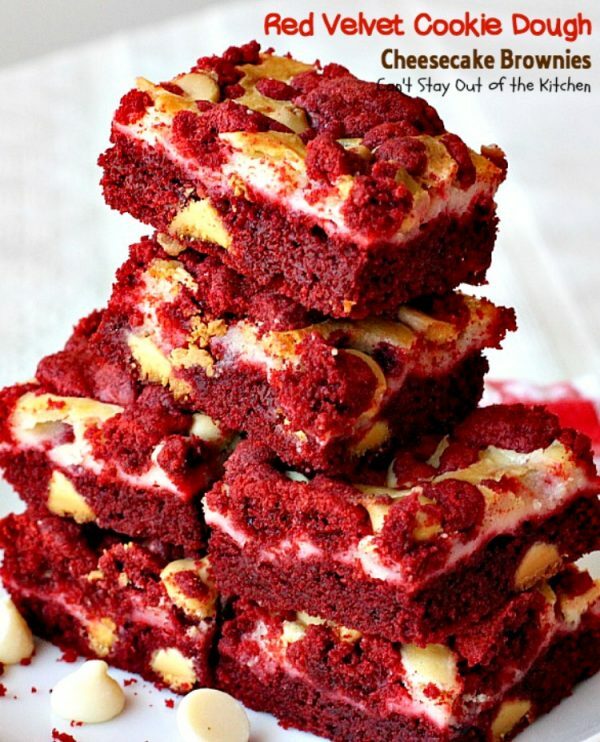 Red Velvet never tasted so good as in these delicious brownies! 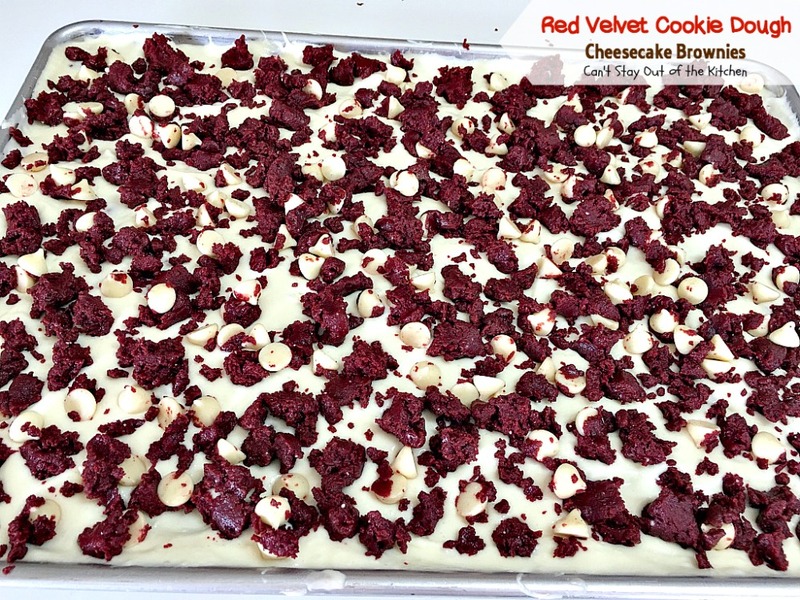 Red Velvet Cookie Dough Cheesecake Brownies are so quick and easy to whip up since they start with a boxed cake mix. 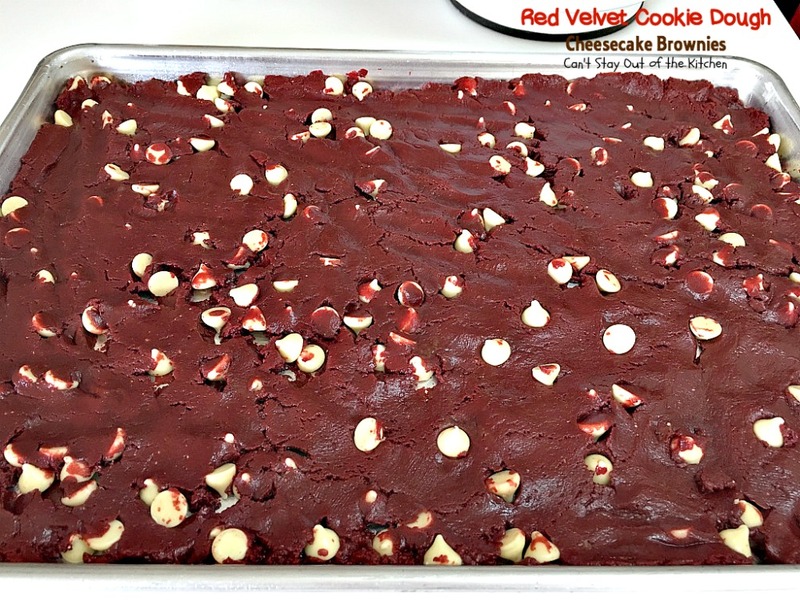 Take a tray of these brownies to your Valentine’s Day parties or holiday parties and they will be snapped up quickly. Go ahead and try one! Just made this and there is a very strong canola oil taste. Followed the recipe completely and even added extra vanilla. Is 1 cup a typo?? Hi, Caitlin. Did you use two full boxes of Red Velvet Cake Mix? I didn’t have any problem with it tasting too oily when I used two full boxes. But I will make a notation on the recipe. Oh yum! These are perfect for Valentine’s Day! Wow, there is a lot going on in that cookie. I can feel the pounds packing on, just by looking at the picture. 🙂 Of course that never stopped me from eatting a good cookie. The addition if M&Ms makes a difference. It’s just a wonderful cheesecake brownie & so easy since your start with cake mix. I want some RIGHT now! lol Looks delicious.